I'm reviewing this movie as a Pixar film because that is essentially what it is. Disney puts some money into Pixar films and then puts their stamp on it, but Pixar is the creative force behind their own movies. I love Pixar's work, so that is why I continue to see the company's movies. As someone who is an avid follower of Pixar, I have seen the first two cars movies and can tell you that Cars 2 was terrible. As lovable as the character may be, no one cares what happens to Mater for an entire movie. 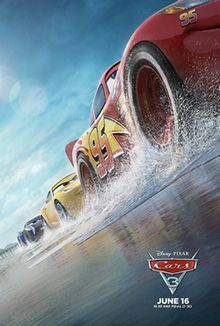 In Cars 3, the focus is back on Lightning McQueen and the story is going to look really familiar to anyone who is a fan of the original Cars. The twist at the end is kind of fun, but overall this one of Pixar's least creative productions. Before I get into what is wrong with Cars 3, let me tell you that Pixar is taking animation to an entirely different level. The use of lighting in dark scenes and the smooth movement of the characters on the screen shows that animation techniques are something Pixar works on constantly. I prefer the old style Bugs Bunny animation, but it is hard to ignore just how amazing modern cartoons look and how far the art has come. Cars 3 has some funny scenes that had my wife, myself, and our grandson laughing out loud. There was a little slapstick, some timing jokes, and some one-liners that were all scattered throughout the movie. There are even some pretty complex characters in the film that appear to be one thing but wound up being another. But as the movie unfolds, you quickly realize that all you are getting is the first Cars movie all over again, but with a few characters switching places. Cars 3 does everything it is supposed to do. It delivers lots of racing scenes, plenty of fun stuff for the kids to see, and it gives a heartwarming ending. But Pixar can normally do that and give the adults something to hang onto as well. The best example of Pixar's abilities that we critics like to keep going back to is Inside Out. That movie is a stroke of genius, and we all kind of expected Pixar to take whatever worked there and keep reproducing it. But Cars 3 is filled with tired plot elements, predictable outcomes, and comedy that is mostly written for the elementary school crowd. Cartoons are for kids, but the long-standing rule for cartoons (started by Looney Tunes) is to write for the adults and draw for the kids. This movie has moved away from that rule and the result is less than spectacular. My grandson and wife liked Cars 3 and I liked it to a certain extent as well. But for me it was 109 minutes of waiting to get to the next joke because I already knew the plot. It takes an adult 10 minutes to understand what is going to happen for the rest of the movie, and even the twist at the end is predictable. There were ways of making this movie equally appealing to adults and children, but Pixar inexplicably chose to ignore its own pedigree and go the easy route. While it works on some levels, it makes for a slow moving night at the drive-in for parents. George Root is a movie fanatic who appreciates the innovative work of Pixar. Follow him on Twitter @georgenroot3, or send him a message at georgenroot3@gmail.com.